This is the most flavourful delicious pizza I have ever tried, blended cauliflower with sundried tomatoes and flax replaces your usual flour crust base with an extra hit of veg and omega’s from the flax. Slathered with a few dollops of Mr Organics award winning chilli ketchup and topped with black olives, onions, cherry tomatoes and basil. 2 tablespoons alpro plain yoghurt. -To make the crust add all of the ingredients into a food processor and blend until smooth. You will have to stop to scrape down the sides every 30 seconds or so to ensure all the mixture is evenly combined. -Set the oven to a 180′ temperature before laying out some greaseproof paper onto a baking tray. 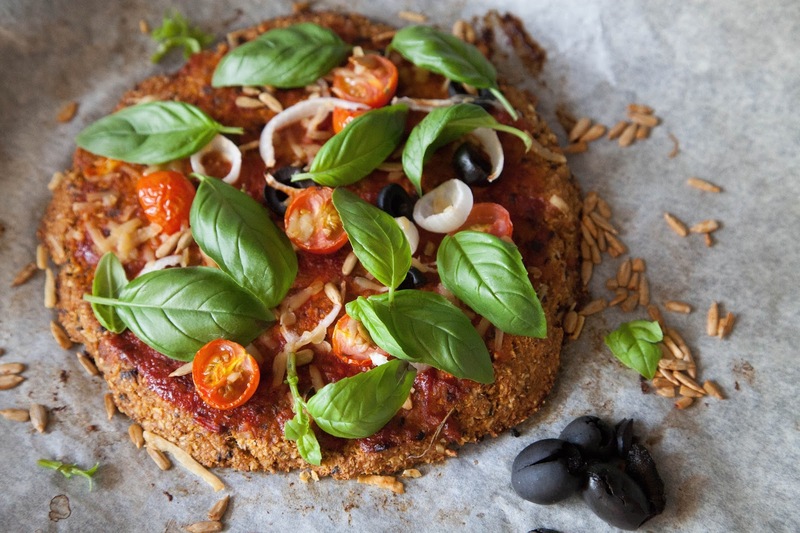 -Remove the cauliflower crust dough from the food processor and spread out to around a 0.5inch thickness, place in the oven and cook for 15mins. -Remove the crust from the oven and add your Chilli Ketchup, olives, spring onions, cherry tomatoes and optional violife grated cheddar. Place back in the oven for a further 7-10mins. -Once the time has elapsed and the pizza is perfectly cooked, remove from the oven and garnish with some fresh basil and mixed seeds before devouring.